Race Winning Brands offers many possibilities to make custom made pistons to specifications you want. Both Wiseco and JE are offering this service. Our sales team is more than happy to inform you about the possibilities. Did you know that Race Winning Brands can make forged pistons to your specifications? 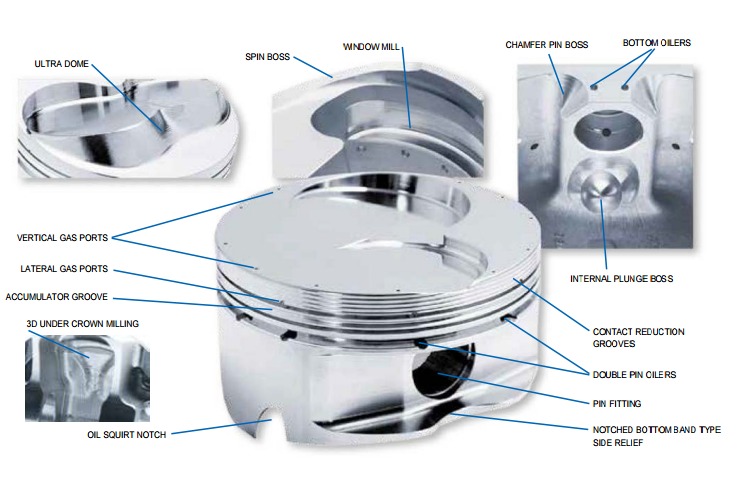 From 4 pieces we can manufacture a custom made forged piston that suits your application best. The design of the piston, the ring package, pin and clips will be matched for the perfect fit and performance. And… it is very easy to order. Just contact one of our piston specialists by using our contact form. All pistons are forged and manufactured at our factories in the USA. Race Winning Brands has vast experience engineering and manufacturing all types of pistons. 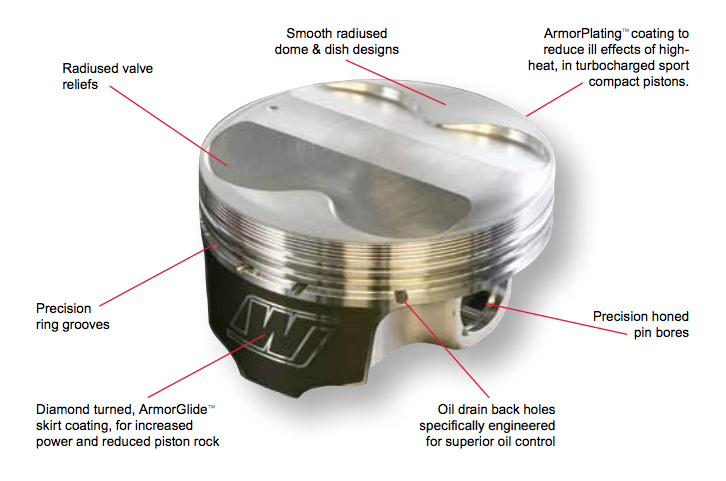 We produce pistons for every form of racing: Drag Racing, Road Race, Rally, Autocross, Off Road, Land Speed, and others. You name it, we make the best piston for it! Vertical holes in the deck of the piston, allows combustion pressure to directly enter behind the top ring on the power stroke, thus pressurizing the area behind the top ring for greater ring to cylinder wall seal. During the rest of the cycle, the ring has normal tension for reduced friction. (Most commonly used for drag race applications). The purpose of machining these grooves is to reduce the amount of contact area against the cylinder wall when the piston “rocks over”. Contact reduction also serves to disrupt the flame travel into the crevice area thus helping to reduce detonation. Applied to the top of the piston and is designed to reflect heat into the combustion chamber, there by increasing exhaust gas velocity and greatly improving scavenging potential. The .0015” thick coating can also assist in extending piston life by decreasing the rate of thermal transfer. Our pistons’ trademark coating that is a lubricating, anti-friction/anti-wear coating applied to the piston skirt only. unlike our standard Skirt Coating, Tuff Skirt will not wear and is designed to withstand many different types of endurance applications, similar to those commonly found in NASCAR. Buildup is .0005” per surface and finished diameter of skirt should include the coating buildup. Reduces wear and material transfer between the ring and groove. Shown to be very durable in maximum effort, high endurance applications. Appropriate manufacturing allowances applydup. Custom piston order form available. Supply as much information regarding specifications as possible. It is very important for us to know quantity, motor type, induction, power levels, RPM, and usage (i.e. – street, drag race, road race, etc.). Our piston specialists will walk you through the process to be sure you get the piston you need. Minimum order quantities apply. Ask a salesperson for details. Remember, Race Winning Brands Europe B.V. personnel are always ready to help. Please call today!